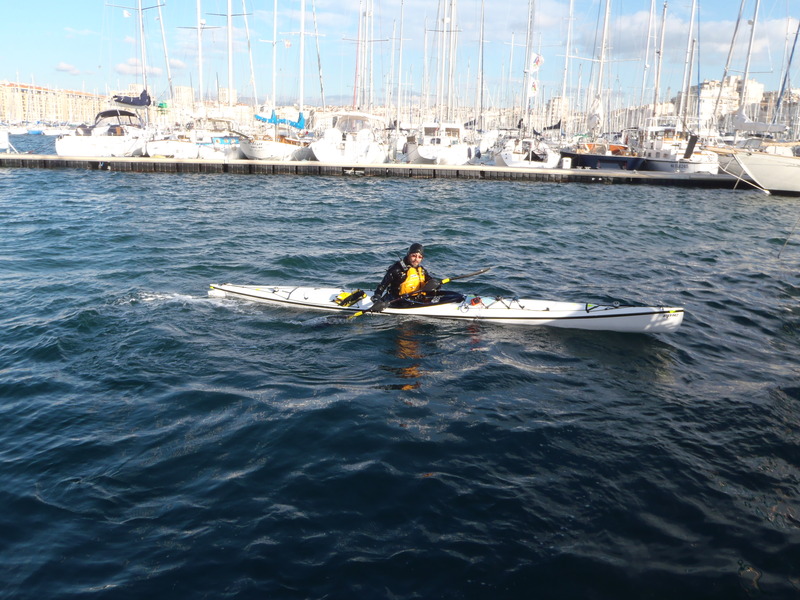 On Friday I paddled the remaining ten nautical miles to Port Oust in Marseilles. The weather was the warmest it had been in a long time. 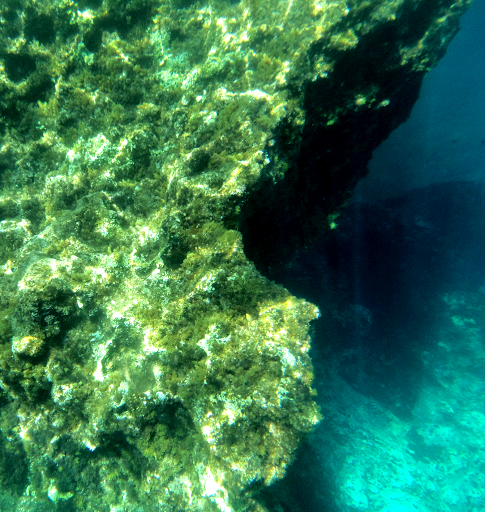 Since the Gulf de Fos the sea has become exceptionally clear, making it possible to see the bottom when near the shore. And the coast had changed from relatively dull flatlands to jagged and mountainous. Cliffs once again began to claw out from the sea and were colored green by thick forests. The rocks took on many colors, one that I saw in the distance was almost white covered bye a wood of tall thin leafless trees, as though it were an old man with thinning hair. I saw another kayaker, the first in a long time. Coming towards me, he was wearing a t-shirt and riding an extremely thin 15 foot boat that looked like a lot of fun. 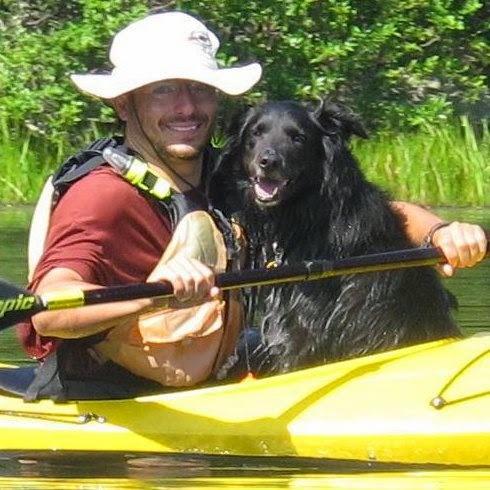 Working his Greenland paddles like a master, we said “bonjeur” to each other at the same moment, smiled, and without another word, admired each others rides as we cruised past. Since the day before I could make out the rugged peaks just behind Marseilles in the distance. What I had read about the weather had nothing to do with what it did, and with a slight tailwind, I made great time. I told myself I ought to practice my roll once I got to port. It was warm out and I would dry off in no time. On the other hand, I didn't need to practice my roll since I was getting so much combat experience. I didn't want to flip myself over on purpose. Why should I risk the embarrassing experience of a possible screw up. If there's a chance you could screw up, then you definitely need to practice. The water is getting colder every day, I don't like to be cold. You won't be cold, that's why you have a wet suit. And besides, if it does make you cold, then you need to acclimate, you sissy. Call my a sissy, will you?! I got to the port and rolled on my strong side. I came up better then ever, it was great. I did a bunch more on both sides and they went wonderfully. I wasn't wearing my wet suit jacket so some water went down the back of my neoprene overalls and filled up my shoes. After a little searching I had a warm shower and permission to leave my boat in the port. It was especially exciting to be in Marseilles. Not only is this my first major city since leaving Barcelona, I'm off of my original map and would need to buy a new one. I had gotten the number of a chabad rabbi who might be willing to host me. I called him and got his address. In the middle of the conversation my phone ran out of credits, but that was OK, I should show up. I was cutting it a little close to the sabbath, but I had time. He was on the opposite side of the city, so I took a bus from the port to the center of the town with his address programmed into my GPS, which could give me a birds flight direction and distance. his house with twenty minutes to spare. I began to jog. I jogged up a mountain, to find a great view and a cliff in front of me, I would have to go back down the mountain and find a way around. 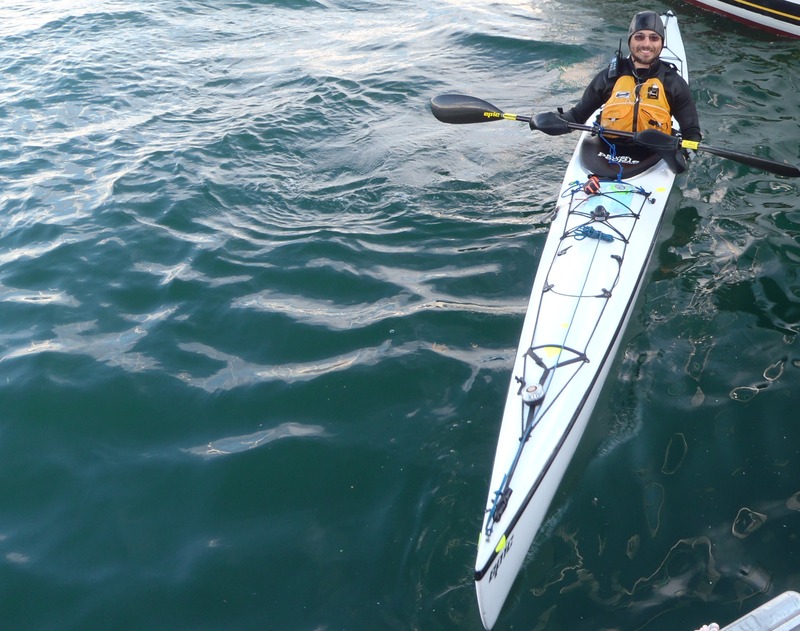 I got to a huge marina, and had to go around that too, once most of the way around I decided that I should have swam from the get go and I would have been across much faster. through backyards, some of fancy mansions. I only hurt myself a little when attacked by a tree branch on the way down a particularly tall one. I got to a river, and needed to find a way over it. It looked too unclean to swim. I looked at the distance I had left and saw that I would no longer make it before the Sabbath. I found a hostel that was nice and went to sleep, for a long time. this, and spoke to me with a little Hebrew. He then told the guard that I was ok and could come in to pray. The gorgeous chapel was one of the largest I had ever been in and apparently designed to resemble some of the great cathedrals of Europe. While it was really nice, there's no way it could imitate the lifetimes of slave labor without just that, or falling desperately short. The rabbi, with a hint, invited me to his home for the Sabbath meal. They served yummy French food that was new to me. Saturday night I went to do some errands. I needed a chart, a stove or gas for my other stove, a new sim card, a battery for my watch, and a baguette for dinner. The chart was the most important. A number of marine stores did not have the Imray series which is the waterproof one. Since I keep my chart on my deck, waterproof is necessary. Finally I was referred to, and found a store that had the chart I needed. They were closing, the last few customers were leaving and the door was locked. It was pouring down rain, which was a good thing since it made me look that much more pathetic when I stood outside and made my sad eye face. It took a while and a bunch of gestures from the clerk that they were closed and their was no way I would be allowed in, but finally they unlocked the door for me. The next day, Sunday, they would be closed and I didn't want to paddle without a chart. This was the first time my sad eye “Please” face has worked for anything on this trip, that was a great victory, not just for me, but for the forces of good everywhere. so how filled was the shull in Marseilles? There were 2 simchas, so it was a healthy sized group. The rabbi told me that ordinarily it's a much smaller congregation.